Welcome to Capital Toyota, Where Family Comes First! "To make the purchase process simple, efficient, and stress-free for people buying and selling a vehicle. This takes outward focus to a whole new level, not just emphasizing the importance of serving customers or understanding their needs, but also putting managers and employees in customers' shoes." Bob McKamey opened Capital Toyota in Chattanooga, TN over 50 years ago. McKamey has hit many milestones and continues to grow in his craft, as he has been actively involved in the Toyota National Council, the Cincinnati Regional Dealer Advisory Board, the Toyota Dealer Council, and the American International Automobile Dealers Association (AIADA). He shows no signs of easing up and continues to add to the rich heritage of Capital Toyota. Since 1966 Capital Toyota has served Tennessee car shoppers with an impressive array of new and used vehicles for sale. Capital Toyota is proud to be a part of Gates Auto Family that has over 100 years of car dealership experience! Car owners visit our Toyota dealership in Chattanooga to avail themselves of the expert auto service and maintenance we offer as well as the full selection of genuine Toyota auto parts we provide. At our new and used Toyota dealership, your satisfaction is our chief objective. We strive to meet and exceed this by employing a knowledgeable sales team, maintaining an extensive inventory and offering competitive prices. If you are shopping for a car or require automotive services, Capital Toyota is the first and last place you will need to turn to. We appreciate the opportunity to earn your business, and we're glad that you are visiting our website. We hope that we can include you and your family with our family of satisfied owners. There are many methods and locations you can choose from when purchasing your next vehicle, but we would like to share with you why people decide Capital Toyota is the first place for them. We are also honored to have received an A+ rating from the Better Business Bureau. This score exemplifies our dedication to our customers and our community, and we look forward to the opportunity to justify our rating to all of you every day. Here at Capital Toyota, we strive to treat each customer as we would a guest in our home. Furthermore, Capital Toyota treats the needs of each customer with paramount concern. We are a local, family-owned dealership that is proud to contribute to many organizations in the Chattanooga, Tennessee area. Some of these include Hamilton County Schools, the McKamey Animal Care and Adoption Center, Teen Challenge, Siskin Children's Institute, MaryEllen Locker Foundation, Helen DiStefano Fund, American Heart Association, and the March of Dimes. We know that you have high expectations, and as a car dealer, we enjoy the challenge of meeting and exceeding those standards each and every time. 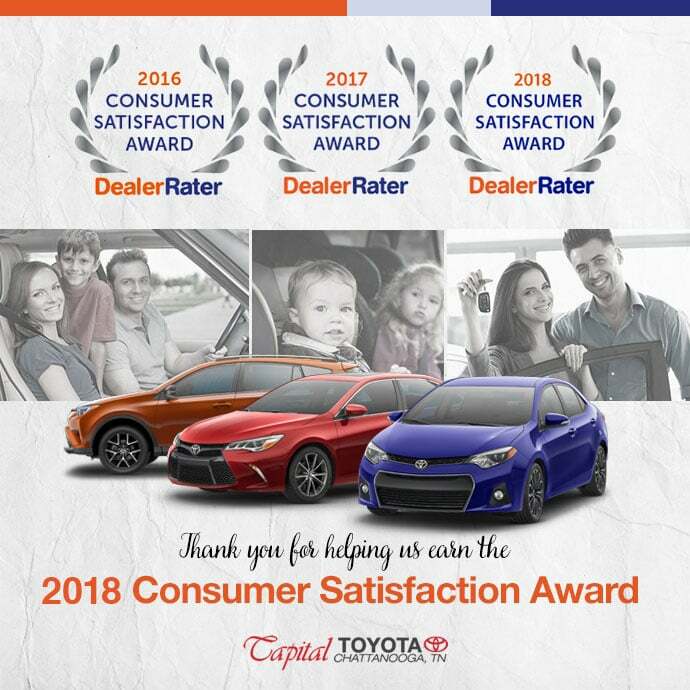 DealerRater has recognized us for our attention to the customer experience by awarding us with the Consumer Satisfaction Award. Capital Toyota offers competitive pricing on all new Toyota cars and trucks, and we will allow you to take all the time you need to decide which new Toyota is best for your lifestyle and driving needs. Capital Toyota is here to help! Our Chattanooga Toyota dealership is well-stocked with the full lineup of new Toyota cars and trucks for sale, and our staff will work their hardest to make your car shopping experience one of the best yet. We specialize in the full lineup of Toyota and Scion products including the Toyota Camry, Corolla, Highlander, Tacoma, Tundra and more. Check out favorites like the Toyota Highlander, Highlander Hybrid, Avalon, Sienna, Toyota Tacoma, or Toyota Land Cruiser. Capital Toyota has something for everyone in our showroom of new Toyota vehicles, and if we don't have something you want in stock, we will get it! If you are considering a pre-owned vehicle of any make or model, you have come to the right place. We have one of the largest inventories of pre-owned vehicles in the area. Our used Toyota inventory includes certified pre-owned Toyota cars and trucks, so you can always shop with confidence. Our dealership lot boasts a moving selection of Toyota models that have been inspected and refurbished by Toyota factory-trained technicians. Each of these late-model pre-owned cars has low total mileage and offers great benefits like an extended factory warranty, 24-hour roadside assistance, a full vehicle history report, and more. Our amazing new Toyota and used car inventory offers a lot of great choices for car shoppers of all walks, from the busy parent to the everyday commuter, the weekend warrior, savvy business owner, and everyone in between. Our experienced staff is eager to share its knowledge and enthusiasm with you. We encourage you to browse our online inventory, schedule a test drive, or investigate our financing options. You can also request more information about a vehicle using our online form or contact us directly. We look forward to hearing from you. Come and visit our dealership today to take home a new Toyota, get your current car serviced by our expert team, shop genuine Toyota auto parts, or find a hassle-free auto loan in Chattanooga.